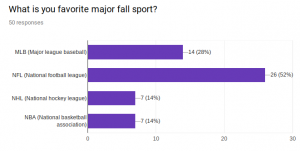 Survey: Which of the four major fall sports is most popular at BHS? Do you like sports? Even better, do you like fall sports? In a few weeks, all four major sports will be competing. Here is what the BHS student body enjoys most. Out of the MLB, NFL, NHL, and NBA, football won by 24 percentage points.